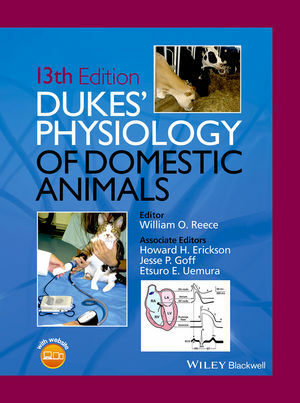 This fully revised new edition of the classic reference on domestic animal physiology provides detailed descriptions of animal function and dysfunction, with an emphasis on clinical relevance and pedagogical features to enhance learning. William O. Reece, DVM, PhD, is University Professor Emeritus in the Department of Biomedical Sciences, College of Veterinary Medicine, Iowa State University, Ames, Iowa, USA. Howard Erickson, DVM, PhD, is Professor Emeritus of Physiology in the Department of Anatomy and Physiology, College of Veterinary Medicine, Kansas State University, Manhattan, Kansas, USA. Jesse P. Goff, DVM, PhD, is Professor and Anderson Chair in the Department of Biomedical Sciences, Iowa State University, College of Veterinary Medicine, Ames, Iowa, USA. Etsuro E. Uemura, DVM, MS, PhD, is Professor in the Department of Biomedical Sciences, College of Veterinary Medicine, Iowa State University, Ames, Iowa, USA.